Customized workbag can be separated for diamond and casting with image and barcode. A workbag is a kind of bag / envelope for a style required to be produced by a contractor, which is filled with style components like stone, diamond, diamond set, findings and casting. Workbag maximum quantity is decided while creating style. Workbag can be prepared for less than predefined quantity but not more than predefined quantity. Workbag helps to keep a proper track of work assigned to contractor. This type of workbag is a standard workbag prepared for completion of sales orders received. Workbag- SPO signifies workbag prepared for fulfillment of special sales order of customers. When an item is required for sample purpose a workbag sample is created. This helps in easy tracking of workbag. When customer returns an item or style for repairs and it is to be sent to contractor for repair, a workbag is prepared for the same as Workbag-Customer repair. Workbag sales line specifies workbag made for production of item(s) which are given to sales executives to promote sales. 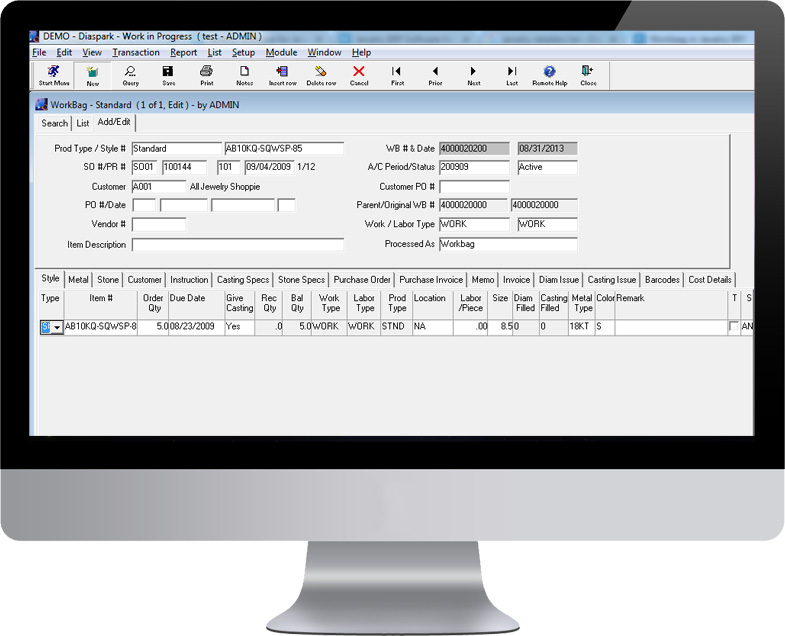 Based on customer orders and inventory Workbags are created automatically. Workbags are bar-coded for easy tracking during production. Workbag tracking is done at different production stages. Cost of production for the Workbag – casting cost, diamonds cost, labor cost, etc. Workbag is prepared and style components are filled within. This workbag is then sent to contractor on contractor memo. When contractor is finished with workbag processing, workbag is sent back and a contractor invoice is prepared. There are two ways for workbag creation. Workbag can be created at the time of processing production request or it can be created manually also. User can create workbag by entering values manually at workbag screen. Each report has different formats to choose from. Quality, Color, Clarity, Shape, Stone Type and Weight Range etc. Registers for Receipt, Issue and Transfer. Sales Memo Status and Purchase Memo Status for Diamond. Activity Report to track a single piece of Diamond. Stock Reports to show On-hand, Memo in, Memo out and Stock. Valuation Report with valuation method as Cost from Master, Weighted Average Cost. Open Lab Memo Report to check pieces with Lab. Reports to check Certified and Non Certified Inventory separately. Workbag can also be created at the time of selecting production type. If production type is selected as WORK, workbag can be generated for such production request at the same screen only. Just select the row from the grid and click at Generate Workbag button. Workbag is ready with all details auto-filled. Once the workbag is prepared for style, style components (diamond/stone, casting and diamond set) are issued to fill the workbag. Issue components option helps user to create and maintain transactions related to issuance of components to contractor. This option helps user to record and maintain issuance of diamonds or color stones in a workbag. With the help of this option user can create and maintain issuance of casting to a workbag. It helps user to keep a track on casting issued. This option helps user to issue findings in a workbag. Workbag transfer allows user to keep a track of workbag stages. It helps user to transfer workbag to different stages. Here user can specify departments as stages so that it will be like transfer of workbag from one department to other. This makes it easier to track a workbag and its current & previous stage. When receiver acknowledges the workbag at receiving end then only the current stage of workbag gets affected. Workbag stage transfer needs to be acknowledged. Acknowledgement is done with the help of this option. Only after acknowledgement the workbag current stage is affected. This feature helps user to split a workbag. On splitting, two new workbags will be created with the quantity assigned by user and original workbag will be voided. Also user can specify how to split the components filled (Diamond/Casting) in the original workbag.